A major electrical retailer has been fined for two tripping accidents that occurred in one of their stores. In Summer 2002 a member of the public tripped over one of 21 unmarked plinths and fractured their arm. The plinths are a serious tripping hazard as they are covered in a similar carpet to the rest of the floor, which makes them difficult to distinguish. An improvement notice was served on this company for all raised areas to be clearly identified. An extension was granted due to a refurbishment of the store, yet later in the year further inspection still identified tripping hazards within the store. 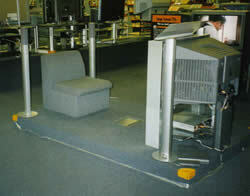 In early 2003 there was a further accident involving a trip caused by one of these plinths. Legal proceedings were instigated by the Local Authority (LA) and as a result the group were fined £9000 + costs at the end of last year.